In September 2017, one of the largest storms of the current solar cycle hit the Earth. A coronal mass ejection left the Sun at midday on 6th September and crossed space in around 36 hours. Starting around 23:30 on 7th September, the first and deepest part of the storm lasted for around 3 hours. Beautiful aurorae were visible all across the UK. Around 13:00 on 8th September a second burst arrived, though as it was during the day in the UK, the aurorae were not visible. They were, however, detected by the newly installed BGS Schools Magnetometer Network. Since 2015, BGS and Lancaster University have been working on an STFC Small Public Engagement Grant to build and install 10 Raspberry Pi magnetometers. These are relatively small and cheap sensors which are installed in schools across the UK. During the storm they measured the change of the magnetic field in the north, east and downward directions. The north (or X) direction is most sensitive to the aurora. The figure (above) shows all the data collected for the storm. 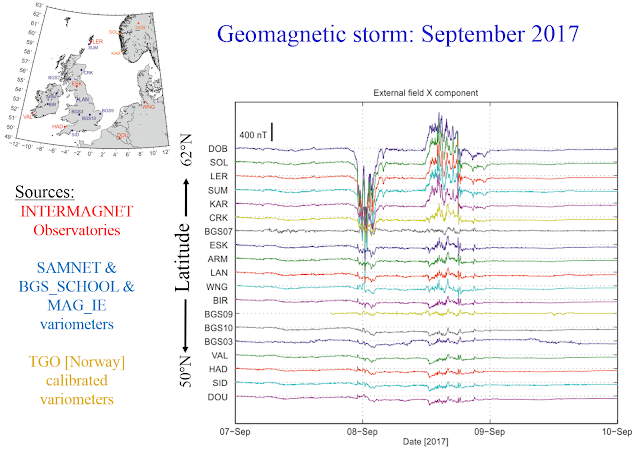 The map shows the location of the scientific observatories (INTERMAGNET), the BGS and Lancaster University network of variometers and a new network in Ireland run by Trinity College Dublin and data from the Tromsø Geophysical Observatory network. The line plots show the change of the magnetic field over the three days from the 7-9th September 2017. The measurements are arranged by latitude. The first and second parts of the storm are clearly visible as large spikes, decreasing in intensity further south. 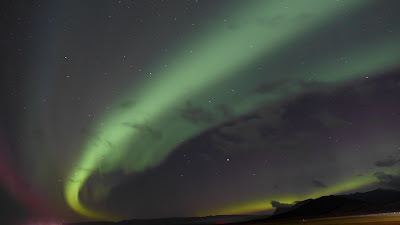 This is the signature of the auroral oval moving south during the peak of the storm, then returning northwards. The line plot data was turned into a map of the magnetic field variation across the UK for each minute. The video of the storm is shown below. At around 23:30 UT the aurora moves southward across the UK (left panel). Several more bursts of activity can be seen later in the day from 12:00 to 18:00 UT.